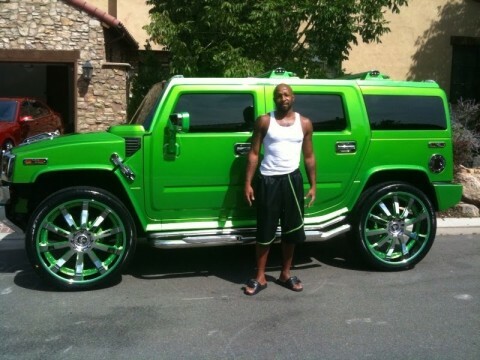 Here is Denver Nuggets guard Anthony Carter standing infront of his Hummer H2. He has nicknamed his car “The Incredible Hulk” and has the hulk airbrushed on the hood of the car. The wheels are 26″ MHT DUB Wheels, chrome and green center with a chrome lip and green pinstripe. Really flashy Hummer, love the chrome and green everywhere and the car has an awesome stance.